I made a second one using a larger size, increased the length by about 2 inches and I came up with this "muslin" with a slightly heavier knit. I found this king at a thrift shop 2 yards for $1 so I do not feel super guilty making king muslins from it. Katy thinks this is a SUPER CUTE 80's crop top but that just ain't happening! Going out in public like this would surly damage people's eyes and scare small children. I lived through the 80's once, not so sure I could make it through a second time. This is more to show how short the top was on my body even after the going up one size AND adding two inches to the length. To show you the first would have be obscene! My next attempt will be to try one more size up and adding length to the bottom. I do not want to go up too much an have to then cut down, so I am going to keep going up one size until I find my perfect fit or until I run out of printer paper. I am cool with either way :o) Have I ever mentioned I hate tracing lines? Hopefully by the week's end I will have this dress all sewn up and ready to wear! Katy is already asking for a dress for her too out of the same material. 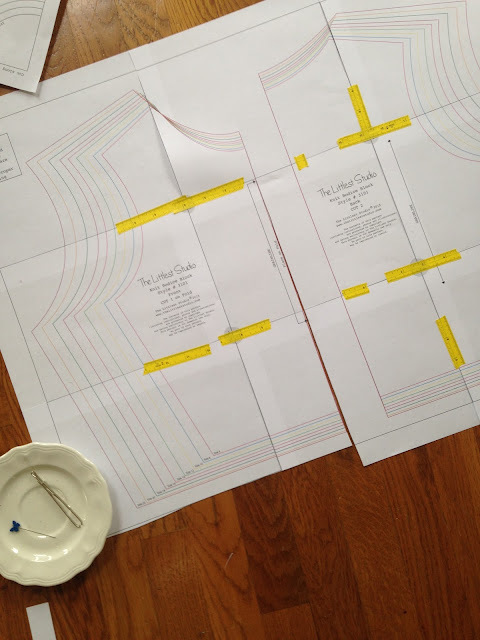 The fit on the bodice looks like it is good, maybe add 1/4" to each seam to give you a little more wiggle room, also with adding to the length, it looks like you can just add maybe another 2 inches and it would hit perfectly. 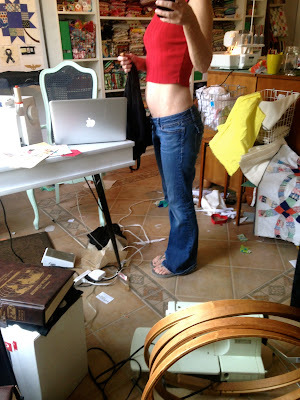 If you measure from the top of your shoulder down to your waist (not your belly button - right where if you bend you get the break) use that to measure on your pattern and add the length to each of the bodice piece, you have a long torso, you this will probably be a common alteration for you. if it puckers at the armholes at all, it may be the length of the shoulders (i usually have to bring them up an inch on each side). It doesn't look like your pattern has a lengthen here line, I would find the middle of the bodice from under the armhole to the bottom and lengthen at the middle there, not just adding length to the bottom of the bodice..
lol sorry for the info especially if you know all this already :D <3 you will totally find your perfect fit.